Ongoing class, begin any time! There is only one You in the Universe! You are brilliantly special and unique. Are you ready to take your paintings to a level where you are able to easily express yourself and let your unique voice and vision shine? Each week we will incorporate a different principle into our painting practice. These fun short exercises at the start of each class will give you a firm foundation to incorporate into the remaining painting time and a firm foundation onto which you can add your special sparkle! There is so much to think about in painting we will focus on one principle at a time with fun exercises. Repeating these help us learn faster and make it easier to integrate them into our artistic magic bag to be pulled into our painting process as needed. Participants can join at any time for the 6 week bundle. Acrylics can be used but I will be able to help you more if you use oils. All levels welcome but some experience is recommended. With over 40 years of professional painting experience, I’m ready to guide and inspire you to understanding your unique voice and play to your strengths and at the same time strengthen your weaknesses. I look forward to working with you on your artistic journey. Capture the viewers heart with your paintings by adding people and pets to your artwork. People want paintings that they can relate to and that tell a story. By adding figures and animals you will immediately tell an understandable and relatable story that your audience will connect to emotionally. This class will cover techniques to help you accurately add people and pets to your paintings even if they are not there. We will be working from a selection of your photos and mine. Bring your ipad and iphone to the gallery for tips and techniques. We’ll be taking it outside in the morning to photograph and observe and bringing it back into the gallery in the afternoon to refine your work. 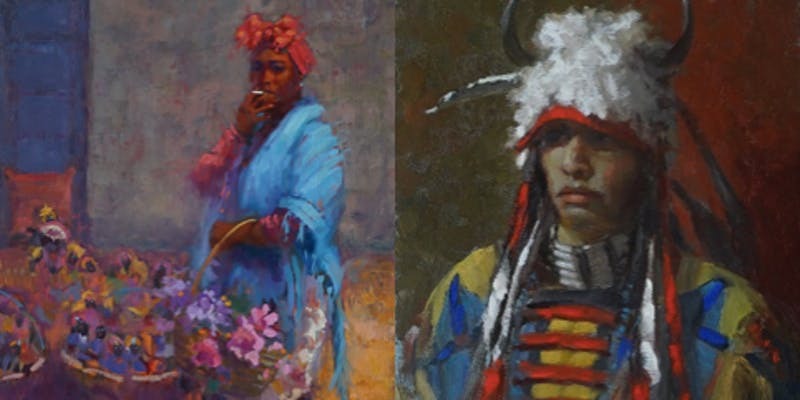 You’ll find the techniques and tips in this class invaluable to emotionally connecting with your audience and adding life to you paintings! HEADS UP! Do you want to quickly learn how to draw faces more accurately? Would you like the hidden secret of painting the head without years of anatomy classes and memorizing every bone and muscle? If your answer is yes, this class is for you. Having this knowledge will help you place believable figures in your paintings even when they aren’t there! Be prepared to leap your portrait and figure work to the next level. This four day workshop gives you the information with practice time in the morning and working with a live clothed model in the afternoon. You will also be given the keys to knowing exactly where each value shift should take place to master the illusion of a 3D form onto a 2D canvas. 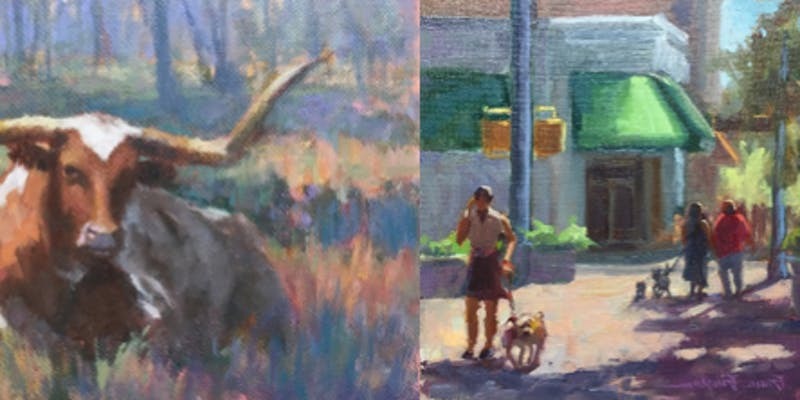 Building on that we will then use color temperature shifts that add extraordinary beauty to your paintings. I look forward to helping you take your artistic journey to the next level. 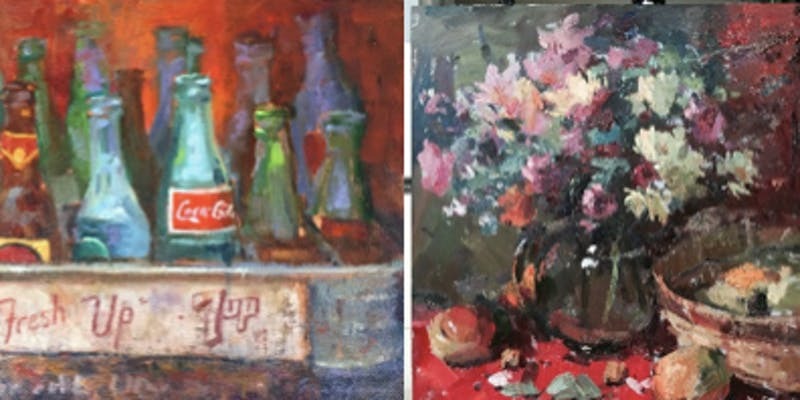 In this four day workshop we sill use still life as a way to improve and develop our technique to make expressive impressionistic paintings, no matter what subjects we choose to paint. We will cover design, observation, atmospheric perspective (yes it appears inside! 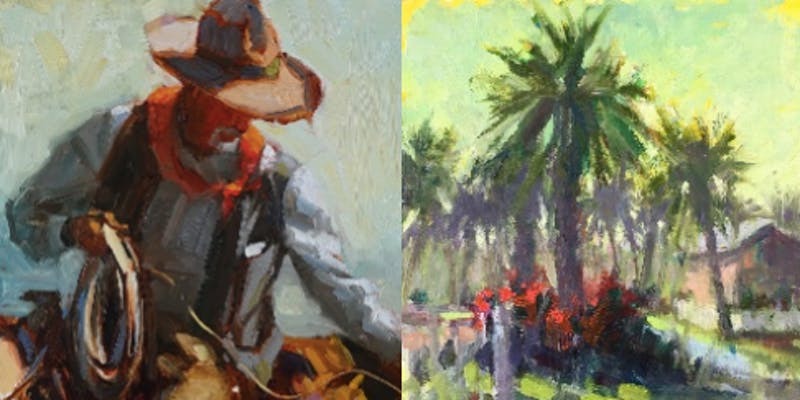 ), focal point and expressive brushwork. This is a chance to step up your painting game and take it to the next level. Join me to have fun and be more playful with your paint!